Kauen resting on the sofa, his favorite spot. The day after Christmas, 2012, a Thursday, our ‘new guy’ was transported from Georgia. 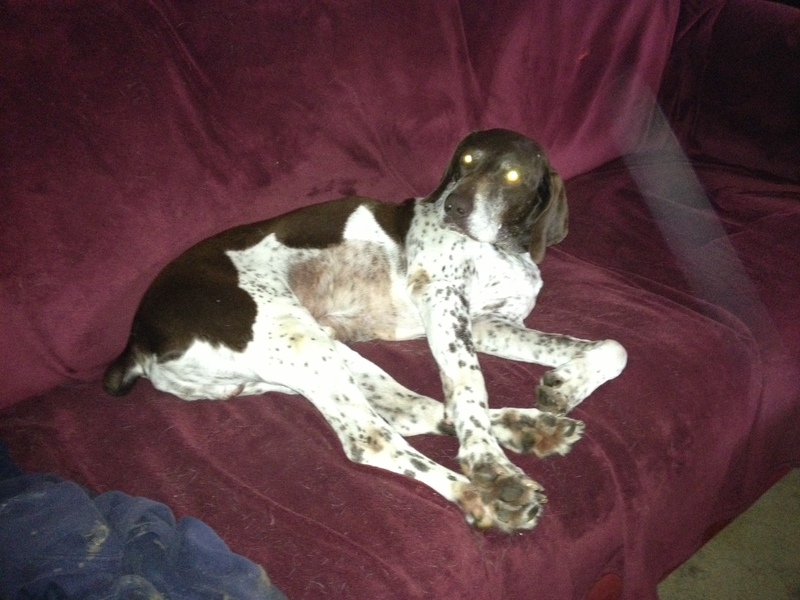 Southeast German Shorthaired Pointer (SE GSP) Rescue picked him up from a Tennessee county shelter so they knew nothing about his history. Time stood still the first weekend GB came to live with us. He ate well the first night but threw up everything Friday morning. In this surprise gift was a 6 inch length of a nylon collar and a 5 inch square of fabric. No wonder he refused to eat all day Friday and Saturday morning. Not liking his behavior we took him to the emergency room Saturday afternoon — an hour’s drive away. X-rays found a complete obstruction in his stomach and intestine. Tragic news! We had known this little guy for two days and were faced with making a life or death decision. Do we put him in for an expensive major surgery or put him down? I had just put one dog down but her condition was terminal; we discovered that Maggie had Stage Four breast cancer and her organs were shutting down. Putting her down was the only option. That was a bad day. There was no way I was going to put another dog down especially since his condition was fixable. Surgery began later that evening. He remained in the hospital for post-operative care until Tuesday evening, New Year’s Eve. As good fortune would have it, we were all home for New Year’s night. What a whirlwind year we had that week with this little guy. Emotions and stresses clashed with each other. That expense was an emergency surgery to the tune of $4000.00 that we hadn’t planned on but Bob and I couldn’t have done anything else. We always rename our GSPs with German names that reflects their personality. Is it any wonder that we renamed GB to Kauen. Kauen is German for chew. We selected this name because he seems to chew almost everything in sight (evidenced by his stomach and intestine contents). But since he’s been home, he’s had two meals a day with small snacks in between. Even before he had completed his post-operative medications he began pooping and peeing on everything. I had never seen such beautiful poop. Classic! Beautiful color, outstanding texture, and perfect shape. Being a male, he’s peeing on every bush in the front yard and down the drive way. and being a new mom, I welcome every marking. We kept him in his crate while his surgery staples were still in place mainly to keep him quiet. But he soon started protesting like the other dogs who wanted out to run. Emancipation day, when his staples were removed, was on a Thursday, two weeks after his surgery. In the meantime I gradually got him out of his crate and introduced him to the stairs from the deck down to the dog yard. Going down ought to be easy but climbing up might be a bit of a challenge. He can’t yet jump up on the sofa yet without some pain so we’re moving very slowly on that but I’m so looking forward to napping with him. Napping with my dogs builds a special bond between friends. Yes, it’s been too long for writing and too long for creative-writing. But it’s been time well spent on caring for a loved one who couldn’t speak for himself. We made the choice to save a little guy we hardly knew; a little guy who had for unknown reasons had been abandoned by his first family. But he’s in his forever home now complete with three other dogs as playmates and two doting adults offering unconditional love. A further test came about a month later when Kauen ate his bedding and, again caused a complete blockage. Again, for the second time, Bob and I sprung for an expensive, ($4000.00) surgery. We’re used to giving our dogs beds for them to sleep on, nice, soft, fluffy beds, just like ours. We’ve had GSPs for well over ten years and none of them have eaten their beds … until Kauen. I had put pure cotton towels in his bed so he could have a softer bed than the hard plastic flooring. Little did I know that the towel threads would wrap around his intestines and saw through them. Apparently cotton doesn’t dissolve/digest fast enough and caused internal damage instead. Sooooooooooooo, following this surgery, he sleeps in the kitchen without any bedding what so every. Not even a towel, nothing, nana, zip. About three weeks later, Bob and I came home from a dinner out to find that he had eaten part of his collar. He must have because it was missing. We rushed him to the emergency room, for the third time. This time we got to him in time. The doctor caused him to regurgitate thereby throwing up his stomach contents. Seeing the veterinarian carry that collar back to us was a most beautiful sight. We’ve done all we can afford. Now our objective is to keep him alive. He’s been reduced to no bedding, a non-edible metal tray as crate flooring, never being left alone outside his crate, and the larger rocks from our back yard have been removed. I’m constantly removing partially eaten paper towels from his mouth. I’m an invasive mom and will go as deep as I need to go to remove whatever he’s been found eating. Unfortunately, a couple of corners have been found missing from at least two cotton place mats. Hopefully they’ll pass. Yes, I do scour the back yard poop in hopes of finding remnants. Thankfully, I’ve been pleasantly surprised. It will be a sad, sad day if Kauen ever eats anything that cannot be easily removed. But I’ll keep working at it. He’s a sweetheart and worth the effort.